Human TSLP (R127A, R130A) (TSP-H52Ha) is expressed from human 293 cells (HEK293). It contains AA Tyr 29 - Gln 159 (Accession # Q969D9-1 (R127A, R130A)). The protein has a calculated MW of 16.7 kDa. The protein migrates as 22-27 kDa under reducing (R) condition (SDS-PAGE) due to glycosylation. Human TSLP (R127A, R130A) on SDS-PAGE under reducing (R) condition. The gel was stained overnight with Coomassie Blue. The purity of the protein is greater than 90%. Immobilized Human TSLP R, Fc Tag (Cat. No. 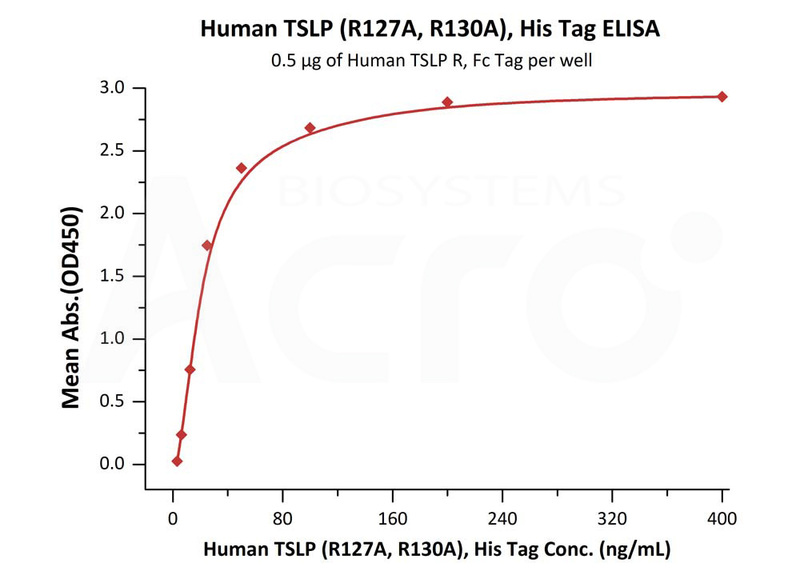 TSR-H525a) at 5 μg/mL (100 μL/well) can bind Human TSLP (R127A, R130A) (Cat. No. TSP-H52Ha) with a linear range of 0.8-6 ng/mL (QC tested). Immobilized Human TSLP (R127A, R130A) (Cat. No. 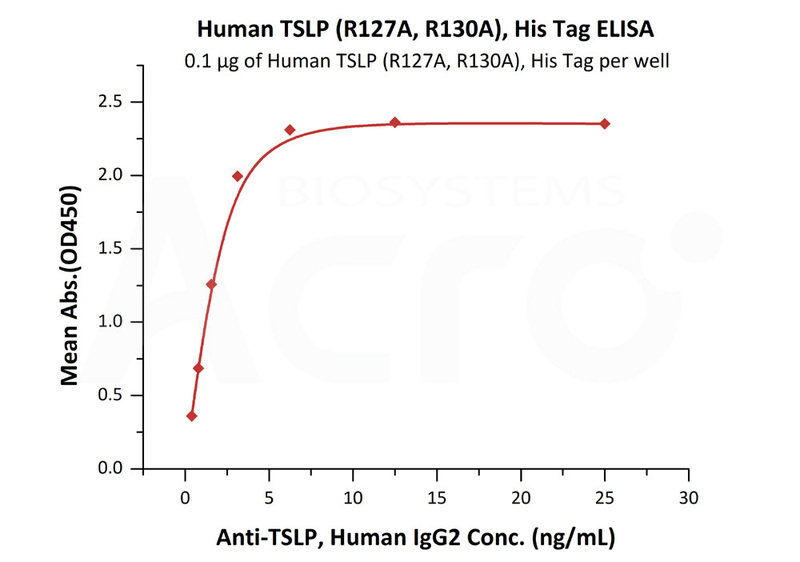 TSP-H52Ha) at 1 μg/mL (100 μL/well) can bind Anti-TSLP, Human IgG2 with a linear range of 0.4-3 ng/mL (Routinely tested). Thymic stromal lymphopoietin (TSLP) is an epithelial cell-derived cytokine involved in the pathology of inflammatory skin diseases, and is widely expressed by epithelial cells. 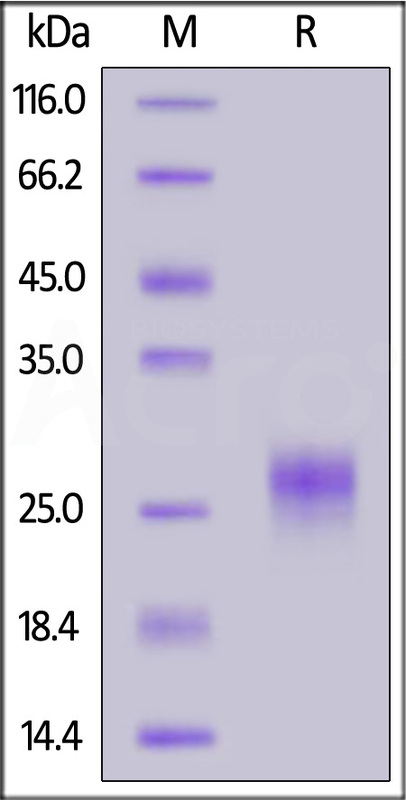 Human TSLP cDNA encodes a 159 amino acid (aa) residue precursor protein with a 28 aa signal sequence (4, 5). Human TSLP has been shown to developing nondeletional central tolerance, amplifying epithelium-induced class switching, inducing atopic diseases and maintaining intestinal noninflammatory environment. Among diverse cells responding to Human TSLP, CD11c+ dendritic cells are the most obviously characterized target cells. (1) Segawa R., et al., 2017, J. Dermatol. Sci. S0923-1811:31012-31015. (2) Wang J., et al., 2008, Cell. Mol. Immunol. 5:99-106. (3) Soumelis V., et al., 2002, Nat. Immunol. 3:673-680.